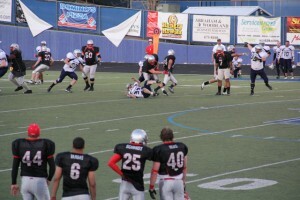 ST. GEORGE– The sun was shining on both St. George and on the city’s semi-pro football team, the Dixie Rebels, Saturday. 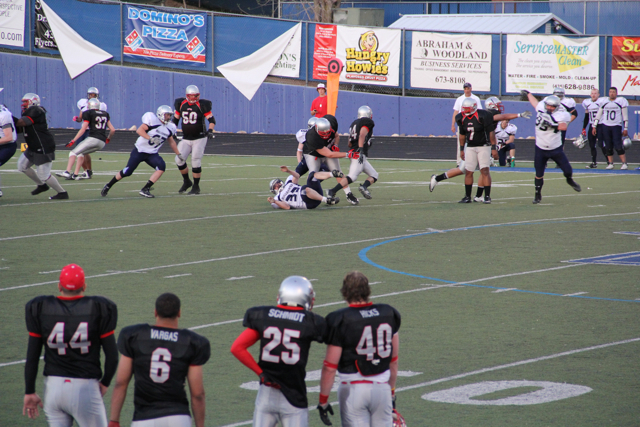 The 2012 Rocky Mountain Football League season opened with a bang at Walt Brooks Stadium with the Rebels taking on the Magic Valley Bulldogs. The Rebels hadn’t played any games since their bowl game in August, 2011, and it showed. They certainly have some wrinkles to iron out over the next couple of weeks, but they were still able to completely outclass the Bulldogs as they got into a rhythm during the second quarter and won easily by a score of 33-3. The Bulldogs went 3-and-out and then had their punt blocked by Jayson Malufau on their first possession of the game; they had both of their first-quarter punts blocked. 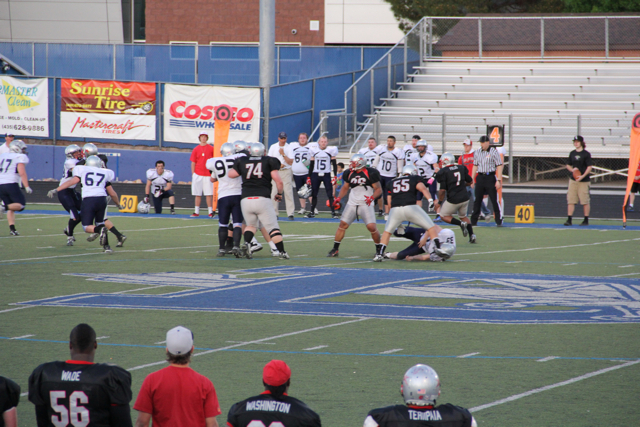 But the Rebels also made a few mistakes in the first, as Kyle Coop started off the game with two runs totaling 41 yards to get the Rebels into the red zone where they fumbled the ball, missing an opportunity early. 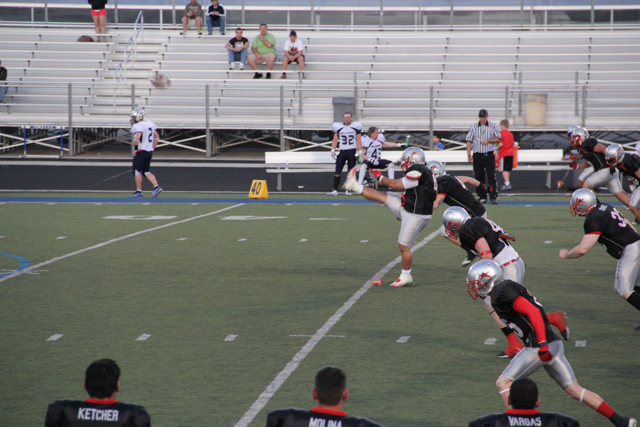 At the end of the first quarter, the Rebels were up 6-0 on a touchdown run by Coop, but missed the subsequent extra point when the ball went to the left of the uprights. Rebels’ quarterback Diarra Fields struggled, hitting receivers and throwing an interception in the second quarter, but he made up for the interception on their next possession with a 13-yard touchdown pass to Andy Stokes. Fields certainly showed his ability to pick up big chunks of yardage with his feet, making multiple runs for 10 yards or more, including one run on the last play of the first half – he picked up over 50 yards before finally being pushed out of bounds at about the 1-yard line. In the second half the Rebels got more efficient. 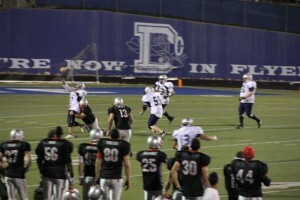 Kyle Coop made an exceptional 32-yard run, which he followed up with a 2-yard touchdown run to put the Rebels up 19-0. 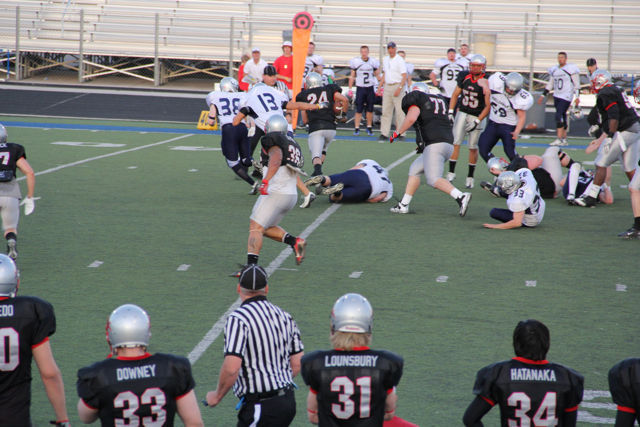 After the touchdown, the Rebels’ defense held the Bulldogs to another 3-and-out. The Bulldogs then messed up the snap and weren’t able to get the punt off, giving the Rebels the ball on the 21-yard line. Fields took care of things from there as he faked a hand-off to the right and ran the ball to the left picking up another touchdown to put them up 26-0. 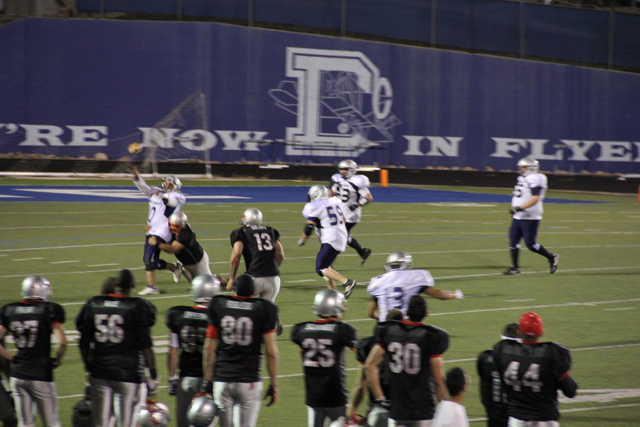 Miguel Rivera capped off the Rebels’ night in the fourth quarter with a touchdown run of his own to put them up 33-0. The Bulldogs were able to get off a field goal on the last play of the game, but the victory was highlighted by the Rebels’ defense: especially the linemen, led by Wayne Alofipo, who had the Bulldog quarterback, Benjamin Landrian, under constant pressure. He repeatedly had to throw the ball early, or while falling to the ground, to avoid being sacked. 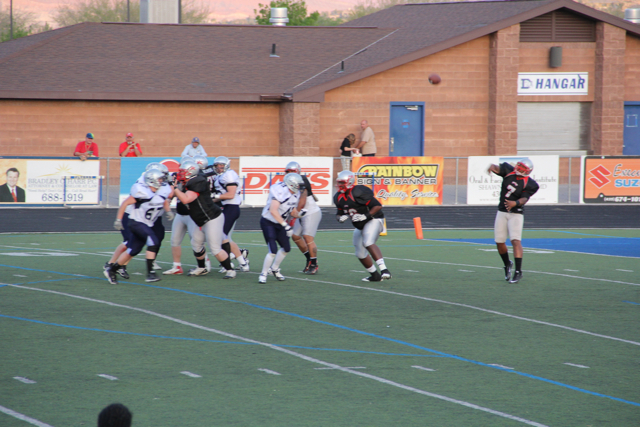 April 14, the Rebels will be traveling to Horseshoe Bend, Idaho, to take on the Treasure Valley Spartans.